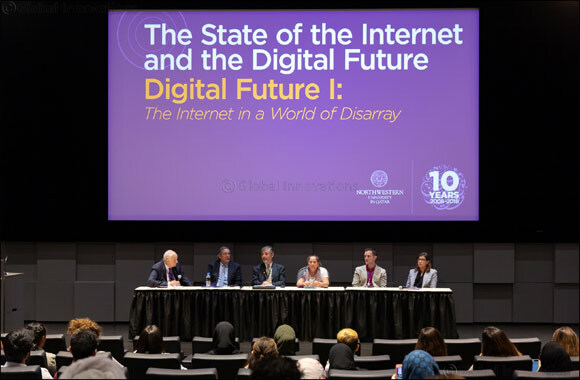 Doha, Qatar – September 26, 2018: At the inaugural event to celebrate its 10th anniversary, Northwestern University in Qatar (NU-Q) hosted a symposium – The State of the Internet and Digital Future – inviting international media scholars and faculty members to comment on the implications of digitization and interconnectivity on a local, regional, and global scale. The study is the only one of its kind in the region and one of the few such efforts in the world. It offers extensive and valuable intelligence about the changes and trends in the media that people adopt, use, and prefer as well as their attitudes and opinions about the role, impact, and importance of mediated communication in their lives and the lives of others across the region. The first session – The Rise of the Internet in the Middle East – was moderated by NU-Q Professor Khaled AL-Hroub, and featured special guest, the director of the World Internet Project (WIP) and head of the Center for the Digital Future at USC Annenberg in Los Angeles Jeffery Cole. Other panelists included NU-Q faculty members Justin D. Martin, Amy Kirstin Sanders, Banu Akdenizli, and Illhem Allagui – each of whom contributed a respective chapter of the retrospection. Giving a global perspective to the findings in the report, Cole explained that while the U.S. and Europe’s populations were connected on the Internet at an earlier stage, the levels of penetration and connectivity in parts of the Middle East have significantly and rapidly surpassed most of the world. The discussion spanned a number of topics including the new tools and ways of communication; the increased reliance on social media platforms like Instagram and WhatsApp for news; the increase in the number of women actively using the Internet to achieve personal and career goals; as well as growing concerns and challenges related to online surveillance, censorship, and the rise of fake news. The Internet in a World of Disarray was moderated by Dennis and featured two international scholars Professors Sergio Goday Etcheverry of the Catholic University of Chile and Andreina Mandelli of Bocconi University of Milan, Italy, as well as NU-Q faculty members Martin and Allagui. To explain the extent of the Internet’s influence on businesses and processes, Mandelli said that the lines between online and offline are blurring as consumers become part of the process for data collection and statistical analysis, allowing corporations to provide customized services and products tailored specifically to their target audience. The panelists agreed that there are many controversies and issues related to the security and privacy of this information, especially given the monitoring and data-control that major media operations have on their users. The Impact of the Internet in Europe and the Global South addressed growing concerns over the internet, despite its accessibility, not being able to improve the living conditions of people around the world and instead creating deeper levels of inequality and monopolization of industries controlled by major organizations. The panel featured Professors Etcheverry and Mandelli, in addition to NU-Q’s Director of the Executive and Graduate Program Jairo Lugo-Ocando. Following an extensive discussion on how the Internet is affecting people’s communication behaviors and influences daily activities, the panelists agreed that despite the increased connectivity and easy access to the Internet around the world, the majority of people’s quality of life has not improved and deeper levels of inequality have been created. The second day of the symposium included a panel discussion with media experts Cole, Mandelli, and Etcheverry – moderated by NU-Q Professor Jocelyn Sage Mitchell. The discussions revolved around the repercussions of automation and immersive technologies that are replacing manual jobs, as well as the dire need for creative interdisciplinary research to put big data into context. NU-Q faculty, staff, and students are engaged in pioneering research across a variety of disciplines – especially related to the future of media and communication – and benefit greatly from listening to expert perspectives and taking part in a global conversation about the digital future. The symposium was the first of several events planned by NU-Q to mark its 10th anniversary in Education City.